Click on it once and your IP gets blocked. You´ll see the ad disappearing in real time without reloading the complete page. 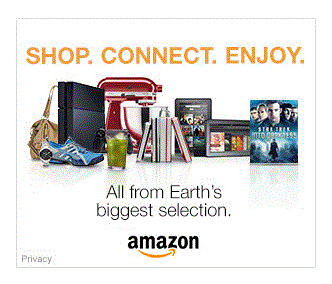 That’s an Amazon ad with removed affiliate referrer only for demonstration purposes. So we don’t earn anything from your click. All blocked IP addresses will be deleted every day at 00:00:00 UTC so you can try again then. Compatible up to latest WordPress version! Why i need Click Fraud Monitoring? Prevent clicks by friends on your Ads who want to “help” you. The Plugin counts all clicks on your Ads. When the clicks exceeds a specified number it will be deactivated and hidden. The clicking user or bot will be blocked on a IP basis for further clicks. At the same time the plugin sends you a notification by email. Why would Google ban me? The motivation behind such automatic clicks is very different. Maybe some competitor wants to harm you or a technical leads to multiple clicks by a human user. They all have in common that you as the AdSense account owner are responsible for any click fraud. You recognize unusual clicks when your page CTR is 1 – 3 % averaged and than it jumps up to 5, 10 or even more. This is where the “Click Fraud Monitor” comes in…for prevention! Thank you for the great product. I use it on all my websites. 1. Is the use of the plugin against the Terms of Service (ToS) of Google AdSense, is the ad code modified? 2. How does the plugin count the clicks? 5. Does it work with installation on localhost? 6. Is there a 100% guarantee that this plugin prevents you from exclusion of your AdSense Account? Due to the possible technical eventualities like rotating IP addresses there is no 100% safety. But this plugin helps you are lot to minimize the risk to be banned because of any malicious clicks. 7. Does it work with WordPress Quick AdSense and WP QUADS Plugin? 8. Does it work in sidebars and widgets? 9. Does it work with alternative ad venders or only with AdSense? Easy to install and very simple to use. Fire and forget. The clickfraud Monitoring Plugin is working very well. The plugin works perfectly and prevent my site ads from getting clicked again and again. The CPC of my ads are also increasing after using the clickfraud monitor. Thank you René for your support. really works, worth every penny! Super Plugin. Top! Top! Top! Is this plugin compatible with google adsense official plugin? Yes, but you have to use a custom class name for the plugin which corelates to the class names google is using for their ad code. Let me know your website and i will check the custom class name for you. Hello please write me to admin [at] xsimulator.net and tell me your mail address you purchased from. 1. Threshold for daily attacks — at this limit, turn off all ads and email admin. Good suggestions. I will consider to integrate it. Thank you! I was probably wrong in sending out the abuse emails. It’s not a big deal — ISPs don’t take it seriously. It’s a waste of time. But I realized that most click fraud is not from actual users, but malware. Most of the people don’t even realize this is happening. Of course, there are malicious users who will click-bomb a site, and this plugin prevents it. So maybe a feature to send an abuse email isn’t useful, unless it’s clearly someone coming from the same ISP, renewing their IP address. That said, what are the ISPs going to do? They want their monthly subscription fee. They don’t care if someone is maliciously clicking on ads. It’s not in their interest. I gotta say, I love this plugin. Looking forward to the update! I’ll be buying the pro version in January. By the way — other users out there: what do you feel is a normal amount of banned IPs? My site gets 2,000 – 4,000 page views per day. I get about 3-6 banned IPs per 1000 page views. Does this sound about right? When I was using CloudFlare, I realized how much malware/bot attacks are out there. That’s another good resource for people using WP or anything else. CloudFlare is an enhanced DNS service that does high performance caching and protects your site from attacks. Of course, I moved off my slow host and moved to WPEngine. They have their own caching and security, which is top notch. It’s not cheap, but you get what you pay for. I can’t say enough about how awesome WPEngine is! Regardless of your host or what other security features you use, this plugin is just a no-brainer. It really relieves me of a lot of worry. Hi, does the ban get lifted on its own after the period specified in the number of days? Also, when you click delete, from the table of banned users, does it delete the user from the site, or just the ban? Thanks for an awesome plugin, too! Hi the deletetion only deletes the ban, not the user from accessing your page. The Ban will not be removed until you do it manually. There will be a function in the premium version that is able to remove automatically a ban after a defined rule. Is automatic unblocking already implemented in premium? its currently not implemented. But its coming with the next update. One thing I just found out — one has to be careful about the cfmonitor div. It could inherit width from the stylesheet, making the div much wider than the ad. If that’s the case, people could accidentally click (or more likely tap with a mobile device), outside the ad and have the ad disappear. On a smart phone or tablet, it’s much more likely to happen. I just fixed it on my site. Use the “Inspect Element” feature in a browser such as Chrome to test this. When you hover over the cfmonitor element, it will show you the area. If it’s too big, you need to explicitly set the width and height. The width of the div you use is inheritate by the parent div, so it should be no real issue. When this plugin blocks my sidebar widget (Quick Adsense) it messes up my theme and pushes all widgets into the footer while displaying them as text. Any ideas? I can check that if you mail me your url. Hi, many thanks for a great plugin. How I have noticed clicks over the set limit, in one case up to 15 clicks from one IP. I am using the new google ad type “asynchronous”. Could this be the problem? unortunately there is no 100% secure way to prevent all malicious clicks. There are some special cases where a attacker is still be able to click on your ads. I will integrate some new feature to prevent that in the next version. A small website can have a limited number of visitors therefore blocking all those who click 2 times your ads will eventually block most of your visitors and that’s not exactly cool A visitor should be able to click your ads more than 2 times in a period of time. – Ban IP for 7 days if more than 2 clicks within 24 hours are made from that IP – or something like that. Yes, make it premium and I will gladly buy it. Btw, what are the exactly benefits of premium at hits point? except email reports, don’t really need that as I already have 55 pages with blocked IP’s and I’m using this plugin for about 2 weeks. With the premium version you get some additional statistic features, like ALL clicks on your ads and the corresponding page. I also implement a automatic unblock function in the premium version within the next week. I also consider to implement the mentioned suggestion asap. Thanks for that. That’s great news and thanks for answering. While browsing the list with blocked IP’s and banning those nasty ones(one of them clicked my ads for over 500 times!! ), at some point all ads from my website disappear and then I see my own IP as blocked with 7 clicks. WTH!? I checked and double checked and then triple checked, it was my IP and I had to manually unlock it. I’m using Adsense for some years now and I know the rules, I never click on my own ads. I used a plugin like this in the past, but the publisher never continued to update the plugin. Will you do so? I have at least 10+ sites I’d like to try it on soon. as you see i am giving a quick and periodically support for the plugin. I am also updating the plugin on a regular basis and improve it with suggestions which are given by my customers. Can you tell me the plugin you used in the past? So i could have a look at it. Maybe there are useful function i could integrate. I want ask you if your plugin works with ”W3 Total Cache” plugin or no and why? Thank you. Hi, the plugin is working with W3 Total Cache as long as the regular ajax.php is not affected by the use of the plugin. Just try it out, and if you recognize any issues, i will create a fix for it. i am having a problem. i said the limit upto 1 click. but in banned ip list. i can see people click 7 time or 5 time. why they are not getting block? I have a suggestion for you. Make a mobile lite of this plug in so that we can check it from mobile while in a go. I will look over the code to make it more responsive for mobile visiting. Thanks for your suggestion. Hi, thank you for plugin, i bought premium version. I have also a suggestion. The suggestion is to hide adsense script code (not just html container) when admin choose (by IP) to hide himself the ads. So, also admin impressions will not be more generated. > The suggestion is to hide adsense script code (not just html container) when admin choose (by IP) to hide himself the ads. > So, also admin impressions will not be more generated. I just purchased the plug in for my site and everything works great, and the support was one of the best iv experienced. prompt and on time with everything. if you have Adsense and you dont have protection than i suggest you do so because their are a lot of haters out there that dont want you to succeed !! Thank you very much James. Was fun to make everything working on your page. Have a nice weekend, mate. i added the at the start of my ad code and at the end of code… but as soon as i pasted those 2 codes before and after my ads disappeared. Maybe im not formatting correctly. Can anyone show me a sample ad code with the div added before and after please? When your ads disappear it means that your ip is already blocked. That is intended behavior. First make sure that there are no banned IP adresses in the plugin section of the plugin. If you write me an email at admin [at] x-simulator.de i will help you. Does it work with Google Publisher Plugin (beta). How? You know in Google Publisher Plugin we didn’t add Adsense code manually. Also i can’t see any adsense code in their file(I m not a programmer). Then where should i add your clickfrraud shortcode? I am using Wp-minify plugin. Is it work with wp-minify plugin. this plugin makes all plugin on same url. You can exclude the clickfraud scripts from the minifier if it should not work minified, but i also use the minifier and with my themes its working well. Hi Varun, if you tell me your site i will check the class name. In the meantime, i am also trying to promote and increase visibility of your amazing work. hello admin. I have a question. I read a comment in another blog. you can check while plugin is working or not with include the image or text. just add division class and then put image or text link and click on it more then 2 time. after that it will be disappear. Is it right or please tell me how can I check? Do blocked IPs get unblocked after “n days” in free version? In premium? If in premium, then what unblock period is reccommended to not be banned? Thanks. Personally i delete every 7 days all blocked IP´s. What about the working of this plugin in mobile browser ? Adsense bombing guys will always have an option to open 3 ads in new tabs if we are displaying 3 ads in a page. Another question what if the bomber is using VPN service and switches his ip ? Hi! Thanks for your work! But there’s a problem – in ‘Blocked user’ list I can see users with 5 or 9 clicks, whereas Click Limit is set to 2 during 7 days. Why is that? I tried to simulate multiple clicks by rapidly clicking that ‘protected’ area but got blocked after 2nd click. Question, does your plugin slower loading pages in the browser? Google monitors the rotational speed download site. Thank you. It should not affect the loading performance of your site, but i will check it. This extension works with Ad Injection / Easy AdSense plugin with? yes its working completely with the mentioned plugins. Hi, can you update the plugin for the wp 3.91 or wp latest version? 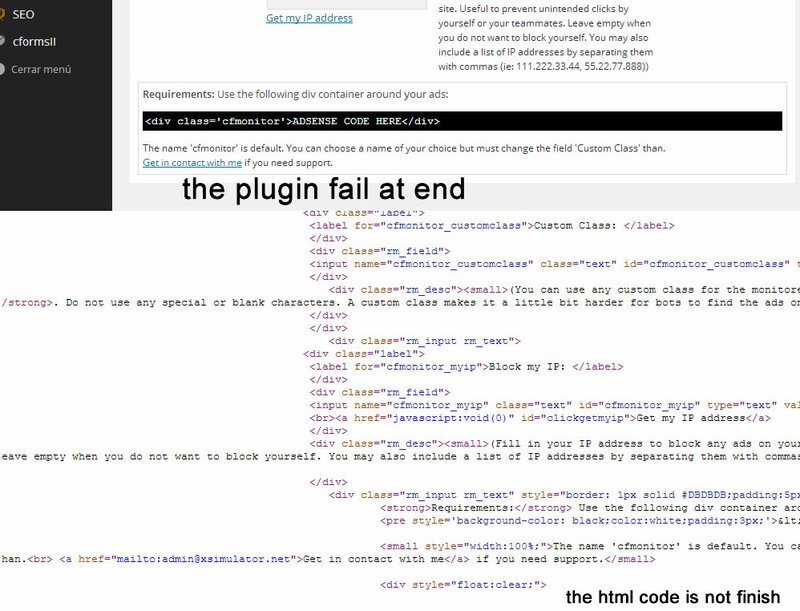 i believe that the plugin fail sometimes under the wp-admin control panel. Brother I also wrote articles about your awesome work but I want to know that if I use cfmonitor around adsense code and then the ads disappeared automatically is that work further or something went wrong ? May i know if it works with Official Google Adsense plugin for wordpress ? Hello. as I can control or disable the sending of mail? post receipt plugin too want to disable this option for sending mail. which adsense plugin you are using? If you like to tell us your website we can help you more. Do you have any intensions of making this plug-in compatible with websites that don’t use WordPress? For example, my website is a php website that does not use WordPress. Could your plug-in be installed on a php website that does not use WordPress? unfortunately this is only working with wordpress sites at the moment. I like how this plugin works. I think if you can include blocking depending on cookies too it would be better. IP can be easily rotated. I have almost unlimited IP addresses. Out of 100 modem reset, none of them have similar IP. So using only IP as blocking measure can be easily get around if someone really want to do harm to your site. I think even using both cookies and IP is not fool proof. Hello, I installed the plugin on my website, and he blocked the ip of the server, so the ad is not displayed. What can I do to fix this? are you using any proxy or cdn like cloudflare? Make sure that your cdn is configured to use the X-Forwarded-For Header. You should ask your provider for support regarding this. Please, make blogspot version. Since blogspot don’t have DB you can create some service and we ready to pay you some money amount per month. Thanks for the suggestion. We are already working on such a service but it needs some time until finishing. why I cant see your plugin on wordpress repository..as of July 5 2015..
this plugin has been removed from WordPress repository… i needed it @ my site… I guess google found this plugin out to go against their terms.. The reason why it has been removed from wordpress is the requirement to rewrite the free version. When this is done we will release it probably wordpress again. 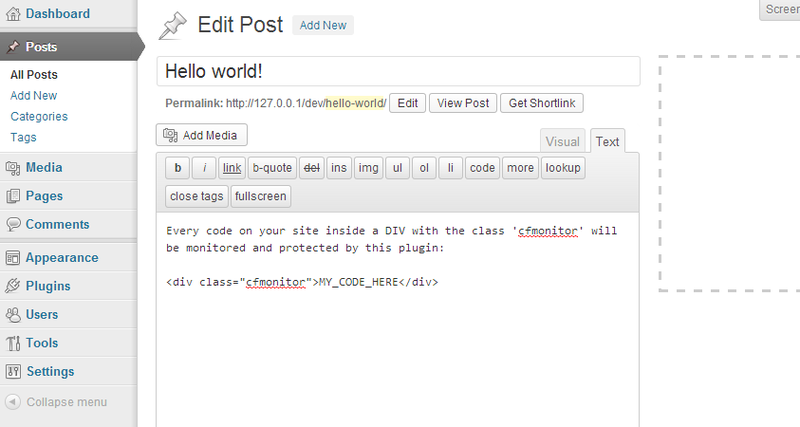 I need the flexibility of having my ad codes inserted via the plugin itself as with say wp-insert. Does your plugin have this option or do I need to manually inject the adcode wrapped in the div manually into my wordpress theme? the plugin is not able to add the adsense code. This must be done manually or automatically with a plugin like ‘quick adsense’, which is imho one of the best plugins for doing so. Dear clickfraudadmin, the free version is not working right, do we have to buy a premium one??? Will the div code work if it applied to adcodes that sit outside the wordpress architecture. 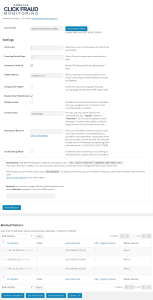 So if I have a page that is not a wordpress page would i be able to add the div code on ads on that page? Im currently testing out the free version and using the default settings of 2 in 7 however Im seeing in the blocked users where some visitors have clicked 100+ times. How is this possible if they are only allowed 2 clicks in 7 days? There are technical limitations, so it is not possible to block 100% of all invalid ip´s without additional resource and performance hungry operations. On some circumstances its still possible to generate clicks when someone is skilled in html and js. There is no 100% safety we only reduce the amount of malicious clicks on the ads. Some people will be able to pass through the click fraud plugin! I will integrate some new function in the near future to better solve this. At the moment it is is not possible to block ALL invalid clicks. is it compatible with adsense ? i mean .. are you sure adsense will not ban accounts for using additional code with adsense code ? Hello, I like your plugin. Do you guys have any youtube demo video ? also, how often you update your plugin ? There is no youtube video from our end, yet. It is Compatible with WordPress version 4.3.1? Unlimited Site? If I want i can provide anyone to use? Unlimited sites means you can use the plugin on all sites that belongs directly to you. hello. I have a question. I read a comment in another site. u can check while plugin is working or not with include the image or text. just add division class and then put image or text link and click on it more then two time. after that it will be disappear. Is it r8 or please tell me how can I check??? You must use the DIV for the plugin functions and do their work? or only you need to be configured without the DIV? its essential that there is an class with a specific element around the ads. This can be an inline span element or div. This plugin is not for joomla? or you can also insert it in joomla? No, its only for WordPress sites but i am working on a webservice for this. I want to purchase this plugin. But will it work on tor Ips. Can it block tor ips if use them in a bot which clicks ads automatically. Or on proxy list. No, its not working with IP addresses reaching from TOR network! Thanks for your reply. I used demo version and it blocked almost 60 tor IP’s in a day. But iam unable to use next day, it is not working. The plugin it self is indeed working with IP adresses from TOR network BUT such IP addresses are changing every time someone visits your website so you get no 100% reliability. I am working on a new version which allows you to decide that only people with enabled cookies will see you ads. Most bots do not accept cookies, so this is a very good way to deliver ads only to qualified visitors and real humans. because of the high load on my dedicated server however the strong cpu and 64GB ram . This Premium Plugin Is Awesome Thanks , Whoever made it Many Many Thanks No Word For You Thanks again. Hello , i have a previous comment with no reply from you . can i purchase another version which depend on databases or external .php file to store the IPs ? because the plugin use “wp-admin/admin-ajax.php” which cause a very high load on cpu . i have a good dedicated server but i cannot avoid the load when when i get +5000 online user at the moment because of that file. Btw. i already send you a mail to the mail address from the comment, so please check your spam folder. thanks for your replay , i’m already have an efficient code working by cookies but i need to save the IPs , it’s very important to me , i think any body have +3000 online user will face the same cpu load . is there any way to solve it please ? If you are using memcached or redis it would be possible to develope a hit collecting script which only calls the memory instead the database but this is a highly custom script which can not be made in 2 hours. how to buy this plugin ? No Ads have been found. Check if the class ‘cfmonitor’ can be found in the HTML source of your page. Specify a valid URL for testing. Y pues no me está funcionando! Quisiera saber que puede estar pasando si en algún momento me funcionó con el mismo enlace que colocaba. i can not find any purchase made from your mail address. Please send me a mail with your invoice id and from the mail address you used for purchase to admin [at] x-simulator.de and i am glad to answer all your questions. this plugin is working pr not? can not find any purchase made from your mail address. Please send me a mail with your invoice id and from the mail address you used for purchase to admin [at] x-simulator.de and i am glad to answer all your questions. sir can i ask what is main differance between Free and Paid Plugin ? so i want to know if i buy premium then what benefit and extra features i will get ? The differences are mainly security fixes and performance improvements so its highly recommended to use the latest version! I already use the plugin on my WP sites , I wonder , if you have any solution for the blogger ? not at the moment. I let you know when there are news regarding this. just disable email notification and it eats much less ressources. I like this plug in. Very-very useful. 1 Site – 49.00€ = $? 2 -5 Sites – 69.00€ = $? Unlimited Sites – 89.00€ = $? i want buy version Unlimited Sites – 89.00€ = $? , price = ? USD. Thank!!! price is in Eur currency. Hello! Sir, Can you clarify doubt on Price? Above mentioned price is per year or month? Price is per year but the plugin will not stop working if you decide not to renew the license after one year. I have click fraud but is not work very well, so I need upgrade for new version? i can not find any purchase from your mail address. If you purchase the plugin i will assist you with the configuration. I uses the free version of this plugin and there is an problem when sit the limit one click for 1 day. There is many invalid clicks even with the previous limits above. So if you can improve the system of this plugin it will be nice then I will buy the Premium Version. the latest premium version is different in many aspects from the old free version. The old free version is not verified to be working well with latest WP version and contains many fixes so its not recommend to use it any longer. I don’t find this plugin even from the list of plugins on wordpress. Maybe because before it was free and now has a cost? Is this plugin admitted by google adsense or is considered an illicit manipulation? Is it safe? the plugin is maintained and developed only as a premium version since a long time. The free plugin is not offered any longer by me because the free version was not able to cover my cost for development and support. Hello. Please reply to BOTH the questions. 1: Is the unlimited site version limited to the sites hosted on 1 hosting account/company or it can be with different ones? 2: And will Google be able to detect and ban our adsense accounts because we are using this plugin? – You can use the unlimited license on all your sites. They are not restricted to the same hosting or server. – There is no known user who was banned because of using the plugin. The plugin is following the Google TOS so there should be no problem. Is Click Fraud Monitor compatible with ‘Easy plugin for AdSense’ or ‘Google Adsense plugin’ or ‘Ad Injection’ or other plugins to insert adsense ads? its compatible with all mentioned plugins. Just use the custom class name “adsbygoogle” in the plugin settings. Hello, i have a question.. if i buy for 1 domain.. and then i want to buy unlimited next month..
how much is cost to upgrade it? i will send you a discount code so you only pay for the difference between single and unlimited version. I did not understand if the cost for a site is referred to a period of time, or does not have a time limit. Hello Costs are one time. Updates are granted for one year after purchase. 1 can i use unlimited website package( Unlimited Sites – 89.00€) for 12 wordpress site which has vantage theme..? 2 this plugin come with unlimited time or limited time..? 3 this plug-in available free updates and upgrade..? 4 can i use in side bar widget..? 5 is it work for any code advertisement ..? yes, you can use it on all your 12 sites. The plugin comes with free updates for one year. After that year you can purchase a new license for a discounted price. Its working for most code advertisements but not for all of them and is only tested well with google adsense. hello the click fraud adsense still working? sure it is working. No issues are reported. I think the tool is good but I never received updates, also the support does not even answer? I have been waiting for several days for an answer, the author replies here but does not reply emails? That is why I am posting here hoping the owner will take care of his already PAID CUSTOMERS! we did not receive any message from your mail address. Would you give it another try please? Can you please expand on how to integrate adsense with your plugin code correctly. I see that you said this “use a different custom class name that correlates to the class names google is using for their code”. Can you give an example of your code wrapped with the correct adsense tags please. Like say this is the adsense code, what do you wrap it with to effectively use adsense click fraud management? i can not find any purchase made from your mail address. Please keep in mind that we give support only for paid customers. I have the 1.9.0 version that bought from you. my version will automatically update or have to buy that version 1.9.3. My version is still the old! Just create a new account on http://demo.clickfraud-monitoring.com/ with your mail address. Than you are able to download the latest plugin version. You also find there your license key. 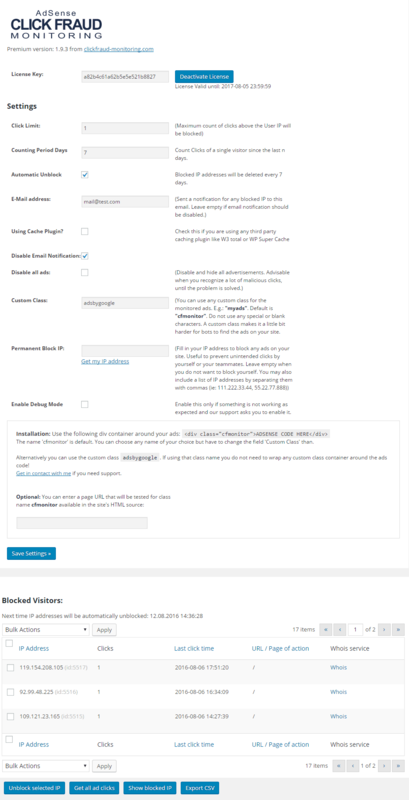 After activating the key from the Click Fraud Monitor settings page you get all future updates automatically. Dear friends I want to try before buying them do not get it? Vietnam I am dealing with you in this way ? Transfer Visa is not ? you can pay via credit card with using paypal. If you are not satisfied we return you the money. I tried to click on your ads demonstration, and the ads disappeared. This is correct as with your description. But, when I tried to click on the same coordinate again (no ads displayed), I was able to click the ads (my cursor became circle). There was no ads but I could click through it. Can you explain? Thank you. Hello`Hendry, what browser are you using? I can not reproduce that behavior under chrome and firefox. Maybe you could create a screencast as well? I am using Chrome Version 52.0.2743.116 m (64-bit). oooh man, this plugin is to expensive for people, actually “me” don’t have much money for starting blogging hahaha. If you are not satisfied we refund you the money back so there is no risk for you. Hi, I was wandering if CFM premium is still updated to buy. Some people say it violates Google TOS.Is it true?.Please tell real truth because we are only dependent on adsense.Don’t let our adsense blocked. Otherwise it is worth buying for features. This plugin is awesome, it`s really working and catching invalid clicks. Great functions integrated! Do not hesitate to buy, the seller proposes and 100%-Money-Back-Guarantee if you are not satisfied, but believe you will be! I got the full package and I applied all my sites completely legit and exciting to work with Adsense and other ad networks. The support is at top level! Thanks! On the good things you do not need advertising will not waste my time any of you, but I’m absolutely amazed by the precise working of the script. The best and what I do ogrono impression is that the developer oklikvat extremely fast your claims and difficulties with the script (in General if you have any) Good luck and I hope it continues to multilateralism and never for saving my business! what is the best setting for this plugin? how muck should be click-limit and click during last n days? Is this plugin compatible with AdSensei B30? Yes, it should be. In case of not using AdSense ad code you need to add a specific container around the ad code. I am thinking to Buy The unlimited package cause i got many threats for my site. if i set limit to 2 for blocking the user i observed we are able to click many many times on ad, the ad gets disappeared when we refresh the page , Isnt this enough to ban my adsense? please note that we only give support if you have purchased one license. 1. is this all payments for forever! or is there an additional fee? 2. How is the plugin update? is it automatic? 3. is able to use the site for my customers? It depends on the license you purchase on how many sites the plugin can be activated. This plugin is very useful and very helpful, I judged this after reading some reviews about this and I will be purchasing this in next few days.. You can really protect your adsense account in real time with this plugin..
1. The latest version of cfmonitor is compatible with wp version 4.8…??? 2. i have 7 sites but i want to buy cfmonitor PLUS and i want to use this on just 5 site at a time. can i Switch my 5 sites in 7 sites one by one or any time by use this premium plugin. or it can be always use 5 specific or fixed sites..?? Please reply me urgent bcz i need it urgent..
the latest version is compatible with WP 4.8. You can switch your sites. To do so, just deactivate the plugin on one site and activate it again on another site. > I’m using adsense click-fraud monitoring v1.7.8 demo and searching for the update because this version is now getting some fatal error. Please direct me from where I can get the latest version of it. sir i purchased 5 website package on june 29 but today after resetting my account password. Please tell me sir what can i do to fix it..
you can login to your account and download the plugin from there but you need to use the same mail address you used for your purchase. Sir i already sent message to the link you provide but no response. Please Check my account and resolve it urgent. Interesting – I checked it again. You were using a address in the United Kingdom but you purchased it from Pakistan. Your name also indicates that you are coming from Pakistan. beside of that Paypal canceled the transaction because the owner of the paypal account, which you were using claimed that he never authorized the transaction. We also had to pay 15 EUR fee to paypal because of this abuse. That’s the reason why your account was canceled. i need a demo. from where i will get that demo? i am not able to see and download link.